We are travelling on a few unsealed roads today so we leave the caravan at Kairakau Beach where our neighbours Kevin and Jill are going to keep an eye on it for us. We set off in the Triton and turn left into Mangakuri Road. This is an unsealed but shorter route to Pourerere from Kairakau. This is our first time exploring these small coastal settlements in Central Hawkes Bay and I’m excited. John doesn’t get so excited about metal roads, but at least we’re not towing the caravan. We see a sign for Mangakuri Beach, and it’s only a couple of kilometres. There’s not much here. Just a few houses and a large area of grasses that appear to have been invaded by rogue agapanthus, along the foreshore. Quite pretty. Back on Mangakuri Road, it’s a journey through real sheep country, hilly but not too winding. The condition of the unsealed road is not bad really, and there are some sealed bits. We reach the junction and turn left to Pourerere Beach. Camping is allowed here (#3893) for a maximum stay of 3 nights. Permission must be obtained from the Central Hawkes Bay District Council all year round, and during the months December – February a ballot process for the sites operates, and charges apply. There is no internet or cell coverage here, so you would have to arrange it prior to arriving. The beach side of the road is packed with tents, caravans and the occasional motorhome. Driving back along the beach road we spy this historic wool press, used from 1878 to about 1930, to prepare the wool bales for loading onto surf boats, which then took them out to small coastal ketches in the bay, for transporting to Napier. There are only a few gravestones there on the knoll now, including those of the parents of the Nairn brothers who were responsible for building the church for a congregation of about sixty. The vicar used to ride up on horseback from Porangahau to conduct services. The little church was taken down in 1928 as it was on a lean, and infested with bees. The short drive to Aramoana is also on an unsealed road. New Zealand Dotterel / Tūturiwhatu and Variable Oystercatchers / Torea breed here. … we’re thinking this must be Ouepoto Station’s homestead. What a grand old house! As we arrive in Aramoana we are surprised to find what looks to be recent development in the form of modern homes. Whether these are holiday homes or permanent residences I don’t know. The roads are marked Private so we couldn’t get too close. This area is Te Angiangi Marine Reserve, which extends down to Blackhead, covering an area of 446 hectares and extending one nautical mile (1.853 kms) offshore. Freedom camping is permitted in the car park (#3896). 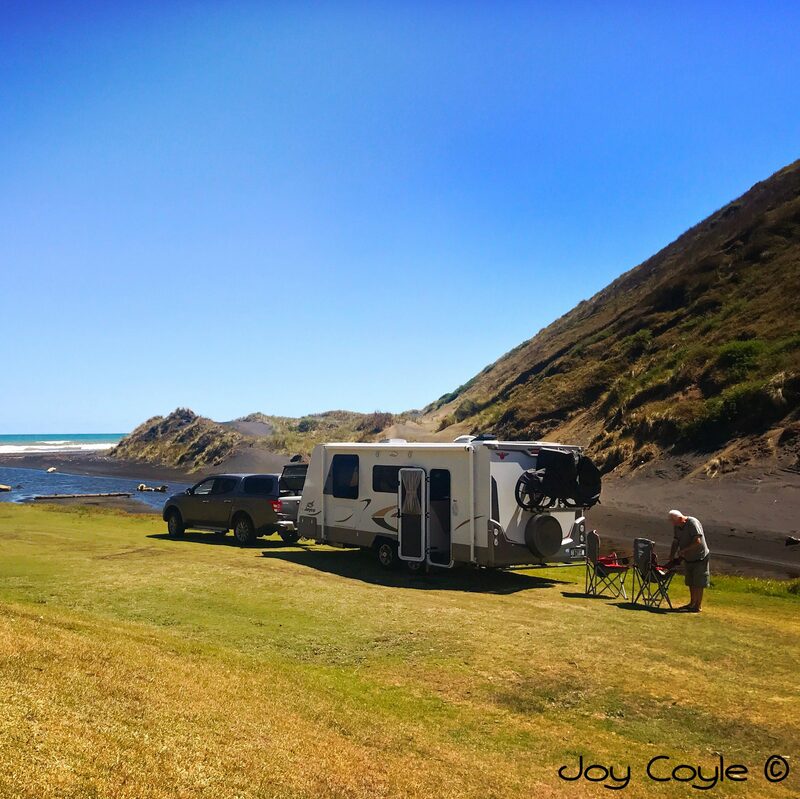 Three spaces are allocated and campers must register with Central Hawkes Bay District Council. Can you see the sheep on the ground surrounded by the dogs? We head back to Kairakau Beach taking the longer route and going to Waipawa township first. We just made it before the last cafe closed for the day. We hadn’t eaten since breakfast. We didn’t stop here but I’ve read it’s a popular place for meals and park-overs (#3925). Back at our caravan all is well. It’s been a fantastic day at Kairakau Beach, and the place is starting to fill up for the long weekend ahead. We’ll be leaving tomorrow for the next part of our Central Hawkes Bay adventure.